I am an exceptionally sweet -natured pooch. I am laid back and easygoing, and have loved every person, dog, and cat whom I have met since coming into rescue. When I first arrived, I was in a fair amount of pain (see medical section, below) yet when they took me to the vet, who had to handle all of my painful areas (my skin and ears), I just kissed and kissed and kissed the vet and vet tech, because even though what they were doing hurt, I knew they were trying to help me and they were being so kind about it! I love attention and affection! I’ve never had it very consistently in the past, and am really blossoming now that I do. I love pets, belly rubs, and snugglies on the couch! I also really enjoy following my foster parents around, watching all that they do, and being included in all of their goings on. They’ve taken me on some super fun outings…we went to a couple of dinner parties at their friends’ house where I got to meet their friends and their friends’ dogs, and we went to Hopshire for drinks and food, and got cooed over and petted by a bunch of strangers and it was so much fun! I also really love going for leashed walks, but since I’m a fairly low energy guy and am a bit overweight, I can only walk about one mile at a time at this point. Once I lose weight and get in better shape, that will undoubtedly increase, but I’m never going to be the kind of dog who can do long days of hiking. I like ambling walks where I get to sniff and sniff and sniff all the wonderful things outside. 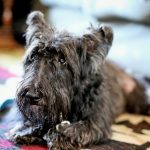 My foster mom says I can be a bit stubborn in wanting to do the walks my way (slow with LOTS of sniffing), and I explain to her that this is a very Scottie trait! I also love the water! When I got to go on a walk near a stream, I waded right in and enjoyed myself so much! I love treats and food! I am very treat motivated, so will be very excited to learn new things from you, as long as you use positive (treat) reinforcement! I am a perfect gentleman in the house, I am given free run, and have never gotten into anything I’m not supposed to…but let it be known that my foster parents never leave food out…if they did, I would surely get into it! 😊 I’m also good in the car. It’s fun to look out the windows and I love that you are taking me with you! I am awesome with people! I haven’t lived with kids, but as long as they are respectful and gentle, I should be fine in a home with kids 6 and older. I am great with other dogs and cats! There are 2 cats in my foster home and we are totally happy sharing a home. I would be fine sharing a home with other dogs and/or cats, but would also be fine as your only pet as long as I got lots of attention and time! Getting petted and getting your attention! Going for slow walks! Wading in streams! Cheese, treats, and other yummy food! Napping! I am a snoozer extraordinaire! I was in rough shape when I came into rescue. I was missing about half of my fur due to a long untreated skin staph infection (not contagious, just incredibly painful and itchy) and I also had a long untreated severe ear infection that was horribly painful. I am doing SO MUCH better now! My skin infection is cleared up, my fur is growing back, and my ears are doing much better though I will probably remain deaf in one ear for the rest of my life, and seem to have some impaired hearing in the other. I’m not totally deaf, but I’m definitely hearing impaired. No one knows for sure what started my skin problems, but it’s a decent bet that it could be an allergy to fleas or to something in the food I was eating, or just seasonal flora, so whomever adopts me will need to keep an eye on my skin and ears, and possibly need to have me allergy tested if my symptoms return. I have a bit of arthritis, and am a little achey at times, so the rescue folks are starting me on fish oil and Dasaquin and Boswellia (an herbal anti-inflammatory that works really well). These take 4-6 weeks to take effect, so by late November, I should be looking perkier on my walks! I will need to be monitored by vets every once in a while until my skin and ears are 100% cleared up but otherwise, I am in very good health! I am a very special boy who was sadly neglected in many ways before coming into rescue. Somehow, I managed to hold onto my incredibly sweet and joyful nature, and now look forward to sharing that with my future forever family! 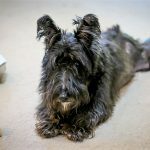 adult, good with cats, good with dogs, good with mature kids, male, neutered, Scottish Terrier, small. Bookmark.